In the browser, PouchDB prefers IndexedDB. Prior to PouchDB 7.0.0, the WebSQL adapter was used for Safari/iOS. The WebSQL adapter no longer ships in PouchDB, but may be installed separately. On Cordova/PhoneGap/Ionic, the native SQLite database is often a popular choice, because it allows unlimited storage (compared to IndexedDB/WebSQL storage limits). It also offers more flexibility in backing up and pre-loading databases, because the SQLite files are directly accessible to app developers. In PouchDB pre-6.0.0, Cordova SQLite support was available out-of-the-box, but it has been moved to a separate plugin to reduce confusion and to make it explicit whether you are using WebSQL or Cordova SQLite. We recommend avoiding Cordova SQLite unless you are hitting the 50MB storage limit in iOS, you require native or preloaded access to the database files, or there's some other reason to go native. The built-in IndexedDB adapter is nearly always more performant and stable. PouchDB also offers separate browser plugins that use backends other than IndexedDB. These plugins fully pass the PouchDB test suite and are rigorously tested in our CI process. These plugins add a hefty footprint due to external dependencies, so take them with a grain of salt. If you need to support very old browsers, such as IE ≤ 9.0 and Opera Mini, you can use the pouchdb.localstorage.js plugin, which allows PouchDB to fall back to LocalStorage on browsers that don't support either IndexedDB or WebSQL. The es5-shims will also be necessary. The LocalStorage plugin should be considered highly experimental, and the underlying structure may change in the future. Currently it stores all document IDs in memory, which works fine on small databases but may crash on larger databases. You can follow localstorage-down to track our progress. This implementation is based on MemDOWN, and will not write any changes to disk. In this case, PouchDB is directly using SQLite queries to build the database, exactly as the WebSQL adapter would. See "Prebuilt databases with PouchDB" for a guide to how you might use this adapter to create prebuilt SQLite database files for adapters such as Cordova or Electron. Technically you are free to use any LevelDOWN-based implementation in either Node or the browser. However this should be considered extremely experimental and not designed for production use. You can also sync to and from these databases to your local PouchDB. Couchbase Sync Gateway support is in progress. It will work, but you may run into issues, especially with attachments. Drupal 8 has also announced support for PouchDB, and there is rcouch as well, but these are both untested by PouchDB. If you are ever unsure about a server, consider replicating from PouchDB to CouchDB, then from that CouchDB to the other server. 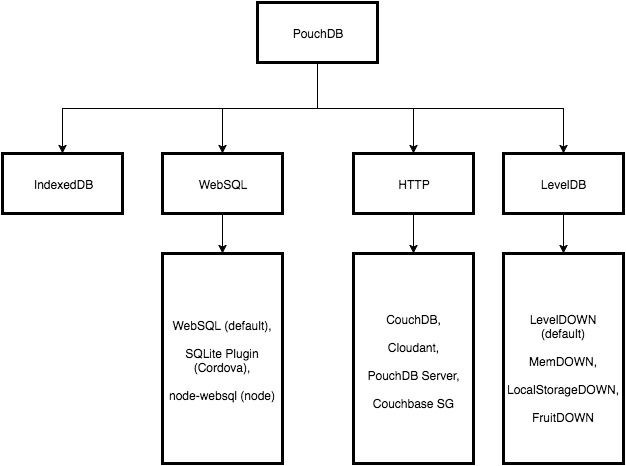 PouchDB Server is a standalone REST server that implements the CouchDB API, while using a LevelDB-based PouchDB under the hood. It also supports an --in-memory mode and any LevelDOWN adapter, which you may find handy. PouchDB Server passes the PouchDB test suite at 100%, but be aware that it is not as full-featured or battle-tested as CouchDB. The underlying module for PouchDB Server, Express PouchDB is an Express submodule that mimics most of the CouchDB API within your Express application.